Raheem Sterling got Manchester City off to a flying start in the 8th minute of the Citizen’s Premier League encounter against Newcastle this evening. 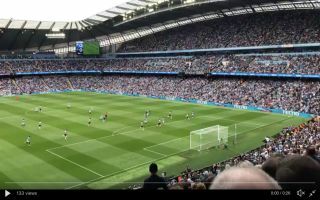 In the 8th minute Newcastle were poor in possession gifting the ball to Benjamin Mendy who slotted Sterling before he skipped past two Newcastle defenders and blasted City into an early lead. Sterling scored City’s opener on what is the winger’s 100th Premier League appearance for the Manchester Outfit after joining from Liverpool in the summer of 2015.